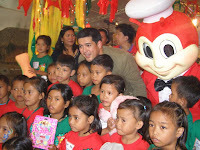 It was a rare experience to partake in a humongous charity event such as Jollibee's MaAga ang Pasko, now on its 14th year. 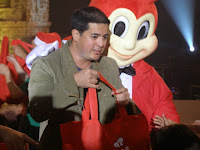 Jollibee was able to collect the biggest number of toys so far - 114,000 toys and books were made available as presents to more than 400 children with the help of DSWD. 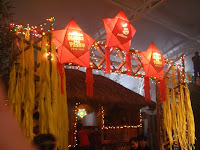 The Mega Tent in Pasig was transformed into a barangay that is filled with the spirit of Christmas - sharing, giving, and caring. 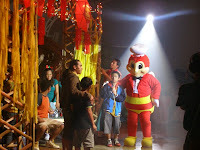 Everyone (ate and kuya volunteers included) was concentrated on making the kids feel comfortable, safe, and making sure that they get the most out of this BIG day that Jollibee has prepared for them. That day, kids were treated like kings and all that matters is for them to go home filled with happiness and the Christmas spirit. 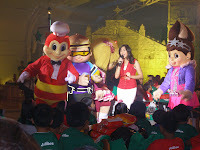 The kids enjoyed a magic show, a mini live play with Jollibee and Buboy as they search for Mr. Yum, Twirly, Hetty, and Popo, and a live performance by their idol Sarah Geronimo. 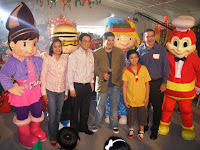 Of course, Mr. Aga Mulach was there to start the gift-giving as he is the brain behind the MaAga ang Pasko project. The tent also had different booths in the form of kubos where kids can enjoy fun activities like face painting. I was surprised that each kid was given a BAG of TOYS when I thought that each kid would only go home with a doll or two. This experience is priceless, I have never seen charity this big. Congratulations to Jollibee, DSWD, the Jolly Toy Scouts, the ates and kuyas, and Jollibee's Ms. Gold Tantoco and Mr. Ernesto Tanmationg. wow ! what a wonderful way to exemplify the spirit of christmas ! 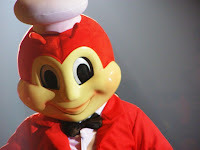 saan ang megatent ? is this the huge white tent along Meralco ave near the Dept of Education ? Yes it is near Dept of Education, it used to be a huge vacant lot. The venue was very easy to spot and the setup was great. I have interviews with Sarah and Aga too, Sarah G's is up at http://styleandrelax.blogspot.com which is also linked to this blog post. Though they are good actor and singer, it's a terrible huge disaster for the people live aside the venue, Mega Tent where often hold parties till 2:00AM. 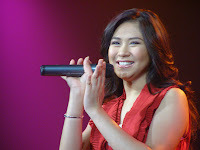 Thanks for acknowledging Sarah Geronimo in this entry. ^_^ I'm a big fan of her.